Technology looks to have permeated into every single sector of our lives, from the car to the home, and heck, even when you are cycling on your bicycle. Well, there are bike computers in the market for a good reason – to help you keep track of your fitness progress in order to monitor your workouts and see where you can go from here. After all, anything that can be measured, can be improved upon, generally speaking. 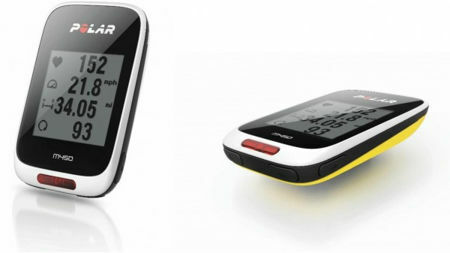 Polar, a name synonymous with fitness products, has just revealed the M450 Bike Computer that will target cycling aficionados regardless of their type. Unveiled at the legendary Alpe d’Huez, the Polar M450 Bike Computer certainly intends to live up to its reputation by being put to the test right from the get go thanks to a multi-day ride. It does not matter just what kind of cyclist you are, recreational or otherwise, since you will be able to still benefit from the M450’s GPS, altitude and heart rate-based features. This is a lightweight piece of technology, and will also be able to handle splashes along the way while coming in an aerodynamic form factor so as not to slow you down. Safety is not forgotten even when performance is stressed upon. The Polar M450 Bike Computer would merge a couple of accessories into a single one, thanks to the presence of an integrated smart visibility LED light that ensures safety is of utmost priority, at the same time helping to minimize the amount of handlebar clutter. It does not matter what your goal is, the M450 Bike Computer will be smart enough to adjust itself to individual metrics and generates personalized feedback, where one needs to enter the right training background, current physical condition and completing Polar fitness and orthostatic tests beforehand, of course. State-of-the art GPS technology and an integrated barometer guarantees high GPS and altitude accuracy without taking up too much juice, while Polar’s innovative Back-to-Start feature will help guide riders home after a long ride. Useful when you are too exhausted to think, eh? Expect the Polar M450 to be available in white globally some time in the third quarter, where it will retail for $189.95 a pop, or $219.95 with the Polar H7 heart rate sensor in tow. World’s Smallest Travel Steam Iron – hopefully it lives up to its reputation!